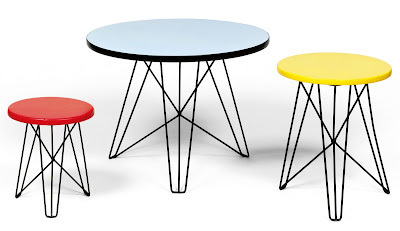 We love this Googie style side tables which were designed by Dutch designer in Constant van Nieuwenhuys and manufactured by T Spectrum in 1953. he tables feature different dimensions and tops in the three primary colours red, blue, and yellow. Only a small series of them was produced between 1957 and 1958. They number among the rare works by the painter and urbanist Constant van Nieuwenhuys in the field of design. 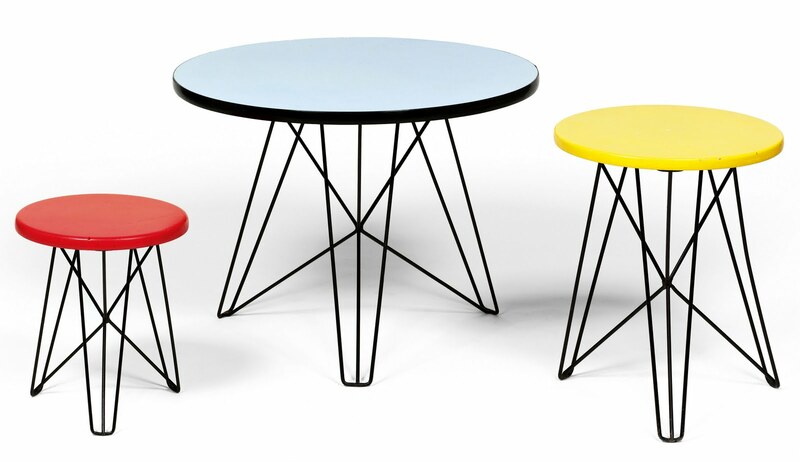 The tables are reproduced on the cover of the t spectrum factory catalogue presenting the 1956/57 winter collection. Constant was one of the most important and influential post-war Dutch artists and a founder member of both the “Cobra” and the “Situationists” movements. Nieuwenhuys collaborated on several of Gerrit Rietveld’s architectural projects, often providing the colour schemes for Rietveld’s plans. He was also a close collaborator of the architect Aldo van Eyck. Between 1957 and 1974 he developed a series of drawings and models for a utopian city called “New Babylon”, in which mechanization allows for the liberation from work and a new “living situation”, with sufficient room for the universal expression of creativity. In 2006 the Barbican Gallery in London held the exhibition “Future City – Experiment and Utopia in Architecture 1956–2006”, where Constant’s “New Babylon” project was one of the highlights.